Half of units at 572 Saint Marks sold.... Apartment 3 at 572 Saint Marks Avenue is a brand new, 1103sf two-bedroom, two-bath luxury apartment in an impeccably restored boutique Brownstone condominium building.Wide-plank red oak floors with sound-proofing, laundry in-unit, Pella windows and doors, Cedar Moss lighting fixtures, Mitsubishi split-system HVAC, Rheem high-efficiency water tank with mobile app control, Bose and Sonos audio system, spray-in insulation for great energy efficiency. Private 59.62sf storage room in cellar. Shared access to large, stone-paved roof deck.Chef's kitchen features Leicht custom cabinetry, top-of-line Bertazzoni stove and hood, Bosch Benchmark series in-panel refrigerator, Bosch dishwasher, Caesarstone counters and custom table and benches. Kitchen opens to extra-deep dining and living area featuring Hearth Cabinets ventless fireplace with marble surround.Spacious Master Bedroom (approx 16'9" x 9'8") opens to large walk-in closet leading to spacious en-suite master bath with freestanding Signature Hardware soaking tub, separate shower, top-of-line fixtures, ample double-vanity sink. Second bath features top-of-line fixtures and cast-iron Kohler tub. Sound proofing materials used in construction of bathroom walls. 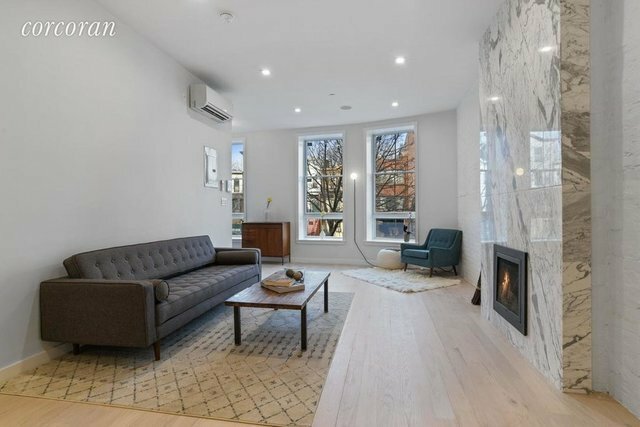 Location: a quarter block off hip Franklin Avenue, close to all the restaurants, cafes, bars and amenities of western Crown Heights and Prospect Heights. Skipping distance from Chavela's, Mayfield, Barboncino, Franklin Park, Catfish, Little Zelda, Berg'n, Breukelen Coffee, Pulp and Bean and dozens more eateries. Only 0.4 miles (6 short blocks) in either direction to 2/3 and 4/5 trains at Franklin and Eastern Parkway and A/C at Franklin and Fulton Ave. Close proximity to Brooklyn Museum, Brooklyn Botanic Garden and a few more blocks from Prospect Park. Welcome home to The 572 St. Marks Avenue Condominium, an exemplary new boutique condo in the most sought after and conveniently located section of prime Franklin Ave corridor of western Crown Heights. Gorgeous restored brownstone facade, bluestone-paved front yard, generous apartment floorplans, wide-plank solid red oak floors, Leicht custom cabinetry, top-of-line Bertazzoni and Bosh appliances, Pella windows and doors, Cedar Moss lighting fixtures, top-of-line Kohler and Signature Hardware bathroom features, Mitsubishi split system HVAC, Rheem high-efficiency water tanks with mobile app control, Bose and Sonos audio systems, sound proofing from Sound Isolation Company in floors and bathroom walls, spray-in insulation for good energy efficiency, private storage rooms in cellar, laundry in each unit, common access to large stone-paved roof-deck.Photos from staged unit 2 with identical layout.Disclaimer: This is not an offering. Real Estate taxes of zero and common charges are projections based on offering plan and applied for/expected tax J-51 abatement. The complete offering terms are in an offering plan available from sponsor. File No. CD180221.